This view of the River Dee in Cheshire looks upstream to the south-west and the distant hills of Wales. It was painted for Sir Richard Grosvenor, the owner of the nearby Eaton estate. 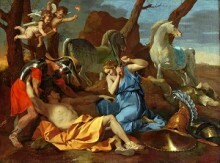 The Welsh artist Wilson had recently returned from Italy (1750-7) where he he began to concentrate on landscape painting. His experiences there enabled him to invest this British scene with a southern feel. 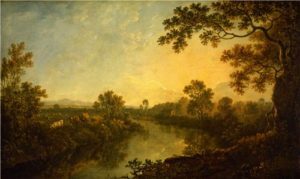 The light from the setting sun, the framing tree, and the river curving into the distance echo paintings of the Roman countryside by Claude Lorrain.